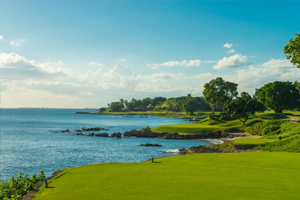 The Dominican Republic’s Casa de Campo Resort & Villas is now offering an “Unlimited Golf Getaway” stay-and-play package. The resort’s three golf courses, each designed by World Golf Hall of Fame member, Pete Dye, are available for unlimited play. Teeth of the Dog, ranked No. 39 in the world by GOLF Magazine and considered one of Dye’s most important designs, is the headliner. But Dye’s design genius is also on display at the resort’s other 45 holes – Dye Fore (27) and The Links (18). The Unlimited Golf Getaway also includes accommodations in a Pete Dye Golf Lodge Room, full American breakfast daily, use of a four-passenger golf cart to travel throughout the resort, complimentary nightclub access and more. The package must be booked by July 31, with travel by Oct. 30. A surcharge will be added for each round on Teeth of the Dog. Twenty-seven-hole Dye Fore joined Teeth of the Dog in 2002. Its three nines – Chavon, Marina and Lakes – are distinct. Chavon features seven holes running atop cliffs dropping 300 feet, Marina meanders down to a harbor ringed by restaurants and shops, and Lakes is artfully crafted across tumultuous terrain. Located in the interior of the resort property, Dye renovated The Links in 2012. The moderately hilly track with tall Bahia grass framing bunkers and undulating greens presents spectacular Caribbean views. Slightly over 7,000 yards from the back tees and playing to a slope of 126, it is considered one of the most-forgiving courses Dye has designed. Check it out at http://www.casadecampo.com.do/golf .